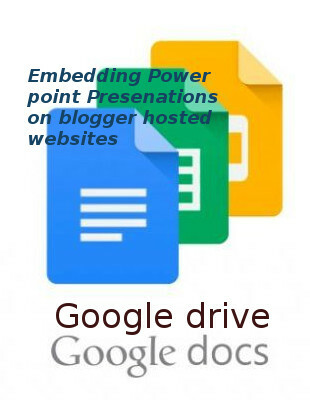 You can show power point slide show presentations on blogger hosted websites by using google features like Google Drive, Google Docs & Google blogger (Blogspot). 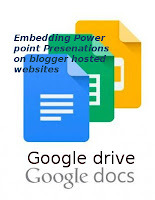 Google drive allows you to upload docs and slides to google data space, Google Doc helps to modify your upload to a presentable format and provides a sharable link or embed code for loading the PPT file on your website page. 4. Click on Main Menu tab and click on "Slides" tab. 5. Click on respective Slide file icon to load the slide file presentation. 6. You can edit the ppt file here, the changes will be automatically saved. 9. You can put this link as a source of an iframe tag to load this presentation on a web page. 10. You can set access rights on PPT file. Thsi will prevent others from editing the presentation. 11. Use the above embed code after replacing the src url with your presentation link. 12. Open your blogger post editor and put the embed code in your Post and save it. 13. Load the blogger post link to enjoy your Slide show presentation.